Welcome to my Halloween Meme! Each Thursday in October I will be asking a Halloween or Horror related question. Check out other blogs for their posts. Question: You have the ability to contact any Horror or spooky author that has passed away. Who is it and what do you talk about? Answer: Edgar Allen Poe. I would love to talk to him about about why he is so tortured! I would also love to know his opinions on scary stories and how and why they effect people. I would really just love to talk to him about anything. 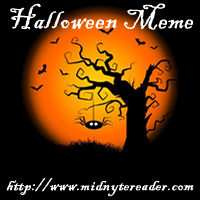 Labels: Edgar Allen Poe, Halloween Meme, Horror Authors. HP Lovecraft. While by today's standards he isn't terrifying his concepts are amazing and must have been terrifying for his time. The Colour of Outer-space was genuinely creepy. I would chat with him about his ideas and what it was really like back then. I'd want to peek into the mind that created Cthulu. SO agree with your choice of Poe! His mind seems so twisty and brilliantly dark and I'd love to know how he channeled that! The Raven still freaks me out. I'd have to go with Poe too! If you ever come see us here in Richmond, we'll take you to the Poe Museum! Hmm, maybe I'll bring you a hostess present from there when I see you in NY! @Suki-great choice. Lovecraft is definitely an icon. @Jamie & Kelly-I love Poe's darkness. @Kate-I've actually been to that museum. There are several of his homes that they have preserved.